The defining debate of the early compact disc era centered around the longbox, a wasteful form of packaging pushed by retailers and paper manufacturers. Today’s GIF comes from a 1992 MTV News report about longboxes, shot at Tower Records’ iconic Sunset Strip location. The year that the National Association of Recording Merchandisers first proposed a 4-inch-by-12-inch standard case for cassette tapes, according to Cash Box. (A standard compact cassette is 4 inches by 2.5 inches.) The report notes that the standard was controversial, but that the alternative to putting records in these massively oversized cases was putting them behind glass, which discouraged the kind of exploration that record stores are known for. 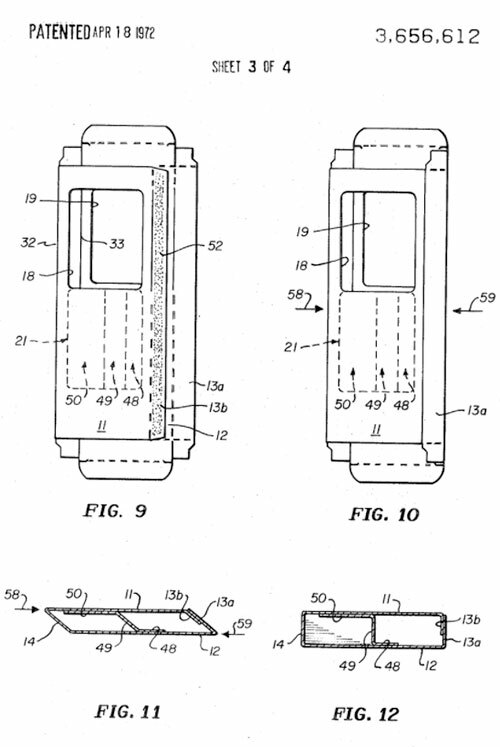 A cassette tape longbox, as shown in a 1972 patent. From a distance, it seems like putting a CD or a cassette inside a massive box, of which more than half of it was effectively useless, would be a really questionable choice. But the record industry had a couple of good reasons for doing so. First off was the size of the racks the industry used for selling its products. Records, with their covers, had a size of around 12 inches square. As the industry introduced new variations on that technology, it was easier to keep the old racks around than to replace them, so any way you could make a format more modular to fit the existing design would be more desirable from a packaging standpoint. The other reason was that the portability of the devices—which consumers, of course, loved—was a lot less desirable in a retail environment. Portability means theft, and theft is a big problem when it comes to music, digital or not. Tape cartridges such as Cassette tape cartridges are quite expensive, and are presently generally packaged in a carton substantially corresponding in size to the cartridge itself; These cartons function to both protectively enclose the cartridge so that the tapes are not subjected to damage prior to the purchase thereof and to display the cartridge to potential purchasers. The cartons are generally satisfactory, however, the small size thereof permits it to be easily slipped into a coat pocket. Stores, therefore, have experienced considerable pilferage and, as a result, desire a different type of packaging which provides the same advantages as these small size cartons, but which is of a construction or size to discourage this type of pilferage. The result of this is that, years before the music industry sold compact discs in 12-inch-long boxes, it sold cassette tapes in a similar format. There was even an industry nickname for these boxes, per a 1971 Billboard article, and it was hilarious: They were called “spaghetti” boxes because of their similarity to the cardboard boxes that held actual spaghetti. While such displays certainly weren’t ideal, they were often cheaper for retailers who didn’t have thousands of dollars to spend on more elaborate anti-theft schemes, which were possible by the 1980s, but not cheap. And as the record industry started to embrace the compact disc, the issue of packaging materials would soon be amplified. Compact disc packaging was basically a nonissue in most of the rest of the world, where unadorned shrink-wrapped jewel cases became the standard fairly quickly. So why did the U.S. market struggle with this particular issue? To put it simply, industry forces were powerful on all sides. The National Association of Recording Merchandisers had enough collective clout that it could dictate dimensions to the music industry, while the record industry could push whatever standard it wanted. But why paper, instead of, say, plastic? 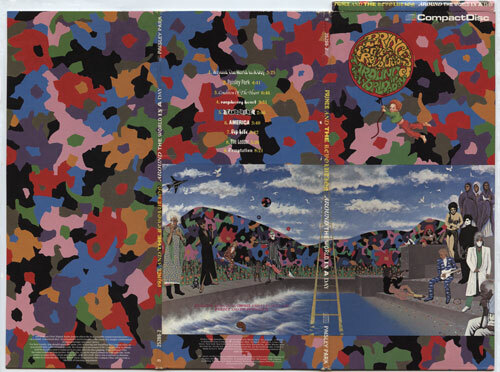 Well, initially, the format was sold to consumers in a jewel case format, but paper manufacturers, aiming to please retailers, went back to the drawing board, aiming to create alternative approaches, some of which got rid of the jewel case altogether. One factor was cost; Per a 1984 Billboard article, manufacturers were eyeing saving money through the use of paper casing. Another was the existing industry infrastructure. A number of manufacturers saw themselves losing potential business in the shift-over from vinyl to compact discs; selling record stores on packaging that allowed them to keep their original rack designs only sweetened the deal. This latter point was likely helped along by the fact that a major label, Warner Bros., owned Ivy Hill, one of the most prominent paper suppliers to the music industry during the 1980s and 1990s. Ivy Hill worked with another major paper manufacturer, Shorewood, on different formats for compact disc packaging, some that didn’t use jewel cases at all. The goal? To prove that paper could be used as an alternative to plastic. They tested the format heavily, and decided what they came up with was better than the solution the CD initially launched with. “The jewel box is not in CD’s future,” argued Adam Somers, Warner Bros. Records’ vice president of creative services, in a 1985 Billboard article. The situation was good for retailers. It was good for paper manufacturers. It may have even been good for record companies, depending on which ones. But it was bad for the environment, and that eventually caught up to the industry. — Robert Simonds, a founder of the record label Rykodisc, explaining to the New York Times why he was launching an anti-longbox movement, which became known as Ban the Box. Rykodisc, which was one of the first CD-only record labels, also had a financial incentive for getting rid of the boxes, per the Times—they were expensive in small quantities for independent record labels. Nonetheless, environmental concerns drove the movement, and Rykodisc was able to get fellow indies like Rhino, SST, Fantasy, and Rounder Records on board—along with public support from acts like R.E.M. and the Grateful Dead. The Ban the Box movement was gaining momentum, with a lot of artists supporting the idea, but getting over the edge of solving the problem didn’t happen until an artist at the peak of his commercial powers stepped up and used his clout to get the ball rolling. The artist, of course, was Raffi. (Who did you think we were going to say?) The Canadian children’s musician used the opportunity of signing a new contract with MCA Records to demand a no-longbox clause be added to his contract. Raffi was a trailblazer. Don’t let anyone ever tell you otherwise. It was a gutsy move, as record stores had basically emphasized that they would not play ball with any efforts to change the packaging. 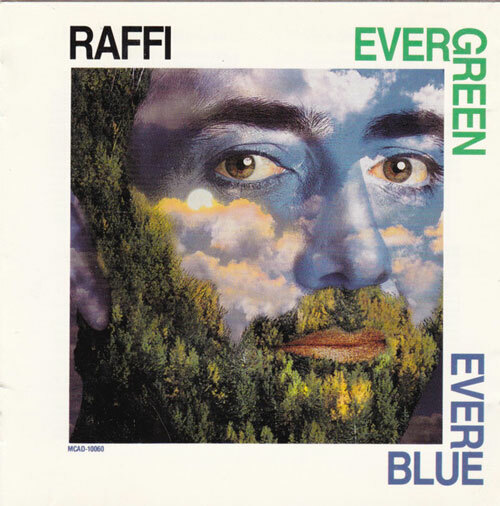 However, the concept fit with Raffi’s M.O.—beyond being a kid’s artist, he was an environmentalist, and the album he was about to release for MCA, Evergreen Everblue [Amazon link], spoke up about his concerns about the environment. “I simply believe that the excessive packaging of cassettes and CDs can no longer be tolerated in a global environmental crisis. If there’s enough pressure from artists and their audience, the buying public, I think record stores will respond by eliminating the long box,” he said in a statement at the time, according to the Los Angeles Times. Soon, other acts, like Sting, made similar calls for changes on their own albums. R.E.M., an act that had publicly opposed longboxes, ultimately approved of them on the album Out of Time because their label, Warner Bros., successfully convinced the band that it could use the extra space to encourage the passage of the Motor Voter bill—something 99 Percent Invisible covered in great detail a few years ago. It made sense that the company would want to find an approach to please record stores—because major record store chains wouldn’t let up on the issue without a fight. For example, at the time Ban the Box was announced, Tower Records President Russ Solomon was passionate about keeping the box as it was. Solomon was so invested in keeping the boxes that he created recycling stations at the chain’s iconic Sunset Strip store so that people could immediately recycle the longboxes at the store. And the paper companies that actually produced the boxes banded together, launching a group called the Entertainment Packaging Association in an effort to convince the record industry to stick with paper. That helped lead to the Eco-Pak, which supported their business, along with the similar Digi-Trak packaging technology that Sting used on one of his records. In response, manufacturers of jewel boxes launched an effort of their own, called the Jewel Box Advocates and Manufacturers. It was an out-and-out lobbying war over how we were going to package these discs. Ultimately, the pressure on the issue would not let up, and in the end, the record industry went with jewel cases. Record stores, which fought the move tooth-and-nail, had to foot a $200 million bill to account for changes, which included, in some cases, the addition of anti-theft strips on CDs, along with purchasing plastic cases for albums that could be reused later. 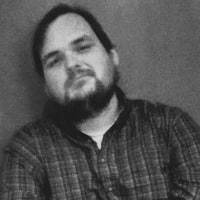 “It was a good transition tool that unfortunately stayed around just a little too long,” RIAA spokesman Tim Sites told the Asbury Park Press in 1993 of the longbox. Soon, record stores switched to plastic casings which looked unusual but did the job, the music industry had some of its most successful years ever, and then the bottom fell out after digital downloads appeared. It sure put that whole situation into sharp relief, didn’t it? In some ways, the saga of the longbox really highlights the declining influence that retail has on the music industry as a whole. Many of the companies that were key figures in the longbox conflict, particularly Tower Records, are no longer operational in the United States, a fact pointed out in great detail by the Colin Hanks documentary All Things Must Pass [Amazon link]. Soon, the rise of online shopping would make the move away from longboxes seem prescient. And just a few years after that, music piracy and downloads cut retailers out of the equation entirely, creating a situation that threatened the long-term prospects of standalone record stores. And with Best Buy and Target apparently getting sick of the fact that they’re dedicating wide swaths of their stores to products that people don’t buy anymore, we may have finally reached the point in the wide arc of music industry calculus where the compact disc is finally on the the fast track to death, at least in the U.S.
All good things must come to an end. Taylor Swift only releases albums once every other year, and she alone is not enough to sustain reflective polycarbonate forever. And she certainly wouldn’t have been able to do so with a case that’s largely empty.